By George Jelliss (August 2003). Further examples and some diagrams added 2012/2013. I constructed nine 8×10 tours (three typical examples shown here) based on extending the braid in the Beverley type tours on the 8×8 to cover the extra two files. They all add to 324 in the files, as required in a magic tour, but the ranks sum to two alternating values. The first has the sums 417 and 393, the second 445 and 365, the third 415 and 395. The next example is constructed by the lozenge method that I found for 12×12 magic tours, but due to the limitations of this board the result is only quasi-magic. The 10-cell lines add to 405 in five pairs adding to 81. The 8-cell lines add to 364 and 284 (the magic constant would be 324). The final two examples, found among my notes and added here January 2013, have file totals 324. The rank totals are 445, 365 in one and 361, 449 innthe other. The first four results above first appeared in The Games and Puzzles Journal, issue 26, April 2003. This example was constructed (by the lozenge method) 25 December 2012. The files add to 452 (formed of four pairs adding to 113 except in the 5th and 7th files where 1 - 3 and 59 - 57 are transposed). The ranks however add to four different totals 875, 707, (3 times each) and 819, 763 (once each). The structure consists of two central 3×8 areas containing the lozenges, with a 4×8 area added at right and left. For a magic rectangle of this size the rank sum should be 791 = 7×113. These two new examples were constructed by splitting the 8×8 magic tour 00b in two and joining up the loose ends by four paths in direct quaternary symmetry. 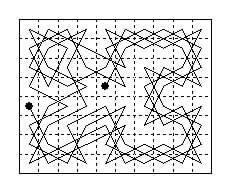 Here is Tom Marlow's 10×10 semi-magic tour with oblique quaternary symmetry (i.e. 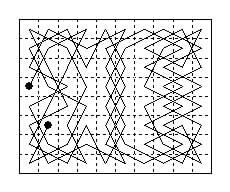 90 degree rotational symmetry) which appeared in The Games and Puzzles Journal, issue 25, March 2003, where a geometrical diagram is also given. The yellow coloured squares are those containing numbers of the forms 4n + 2 or 4n + 3: there must be an even number of these in a line for it to be magic. Here is an 18×18 semimagic tour by Awani Kumar sent to me on 19 June 2013. It is based on 6×6 tours joined together. All ranks add to the magic number 2925. Regrettably I have not had time to check all the totals properly. Awani Kumar has also sent this even larger 30×30 semi-magic tour, on 21 June 2013. It is formed from the 18×18 example by surrounding it with 6×6 tours. All ranks add to the magic number 13515. Here again I have not been able to check all the totals properly.